Whew, so there is my little bit of personal share for today. Boy do I feel better LOL. Thanks for listening. Now, let's move on to better, happier things shall we? Like today's share. This card is just a single card. Which is what i call cards that don't open. It is standard size of 4 1/4" x 5 1/2" and that's that. You would flip it over and place your message on the back. I wanted to go with nice Springy colors because like i said last week, i am hoping and praying for Spring to come SOON. The base of my card is using the Soft Sky card stock. 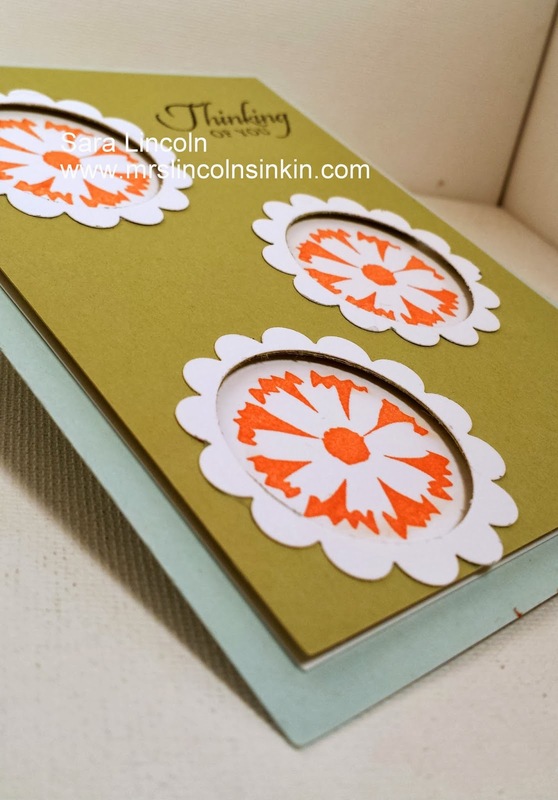 I then topped that with a piece of Pear Pizzazz card stock which measures 1/4" smaller on all 4 sides. This is the card that i will be sharing this Friday on my Friday Video. I love how this card has dimension without really having to do anything but adding Dimensionals. And i LOVE these colors together!!! The stamp set that i used today is a set that you can get from the Sale-A-Bration brochure right now for FREE with any $50 purchase or more (prior to s/h and tax). Click HERE to see all the great items that you can receive for FREE. This particilar set that i used is called Petal Parade. Below is a closer look at the entire set.